City of Emerita Augusta, at Merida, Badajoz. with the most outstanding remainings. The Roman city was founded at year 25 b.C. -August Emperor- by legate "Publius Carisius", in order to make a retirement place for veterans from "V Alaudae" and "X Gemina" legiones who fought in Cantabrian wars. In spite of being placed on a few Romanized area and surrounded by tribes: Vettones, Turduli, and Lusitanians, it soon became a very outstanding focus of the land, with almost 50.000 inhabitants. It had a perfect situation: as Roman "bridge-towns" -Corduba, Touluse- it was placed at the bank of Guadiana river at the cross of important communication ways. Hills around it give it shelter and are the ideal place for constructing great pubic buildings -theater and amphitheatre-. 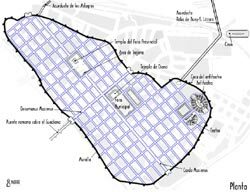 Close to it there were water wells, raw materials for building, productive lands, woods... Beside, planning of the city was perfect: perpendicular streets all along the city made that Emerita Augusta became one of the most important Roman cities. Its increase was rapidly done, becoming the capital of Lusitania, one of the three provinces that marked divisions of Roman Hispania. At year 15 b.C., Marcus Agripa gave a Theater as a present to the foundation of this city and capital, also accomplishing great works for setting. The wall was then already constructed and the city was designed with its Kardo maximus, Decumenus and its Municipal Comitium where temples for Imperial worship were elevated: for Diana and Mars. Seven years later, an Amphitheater, was built, close to the Theater. It was modified until 1st century. Circus and bridges over rivers Barraeca and (Guadi)Anas were also constructed at this age, as well as gutters, aqueducts, etc. Ca. year 50 a new Provincial Comitium was created: a porticated space. Its entry was made through Trajanus arch. Several works for improvement the Theater and Amphitheater were made at this century. Influence of Emperors from Italica, Trajanus and Adrianus made the city evolution in every field: social, economic and cultural. Buildings for high level society -Domus- were made with luxury materials. Those domus from la "Alcazaba” and “Mitreo" are outstanding. Among religious persecutions at the end of 3rd. century and beginning of 4th. one, must be remembered martyrdom of Eulalia. At that time new domus are built or restored, as Marbles House or Theater House. 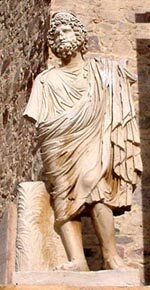 Later, reformations by Dioclecianus gave Emerita Augusta the condition of Metropoli as a center for communications and a residence for Proceres. Roman persecutions to Christians finished at 313 after Milan's edict, written by outstanding Emeritan Christians among other authorities. The wall. Elevated at August age, it was later amplified for including the theater and amphitheater in it. Remainings of 5 doors and 7 towers did survive. Its structure is the usual for Roman walls: it consists of two walls of "opus incertum" or opus quadratum, in function of the area, filled with stone and lime with earth. Portico of the Comitium. Recently discovered, it would be one of the limits for Comitium. Remainings may belong to a porticated construction that marked limits for comitial whole. It was decorated with several sculptures placed on furnaces and supported by corinthian columns. 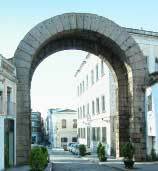 Trajanus Arch. It was probably the main entry to this Provincial Comitium devoted, as Municipal Comitium, to Imperial worship. Its name is arbitrary, since nobody knows surely when it was constructed. Built with granite ashlars covered with marble, it is 5,70 m. wide; 8,60 m. long -arch's gate- and 13,8 m. high. Basilical Temple. Remainings of this building with an unknown function do survive. A podium being 3,10 m. high, 8 m.wide and 15 m. long can be imagined. It is not well preserved -only a part of the basement- since several houses were constructed on it. Public -thermae- and private -balneum- termal wholes have been discovered in this city. They were conceived at 1st. century b.C., but works went on being improved until 4th. century. Banos Street keeps remainings of public termae. Other wholes are duplicated: one side for women another one for men. Termae f Alange. Placed at 18 Km. from the city, can be found this outstanding termal whole. Persons from Roman high society of Merida came to these termae. Their plan is rectangular being 33 m. x 16 m. The inner part is composed by two circular chambers similar to each other being 11 m. diameter and more than 13 m. high, crowned by a dome with "oculus": an upper door for ventilation and illumination. At its center, there is a pool with perimetral rows for access and sitting. 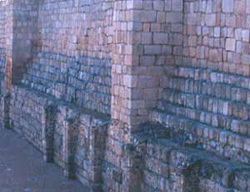 The whole is specially well preserved and is still used. Plan of the Domus of the Theater. Domus of the Alcazaba. Kind of house with a peristylum -porticated patio- as an axis for distributing rooms. 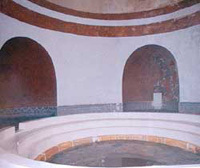 A pavemented triclinium with "opus sectile" is in front of an exedra close to a pool in the patio. It is not easy to date -maybe from 1st century- since it should have been modified several times. Most part of remainings seem to be from 4th century. Domus of the Garden of Otero. Another instance for a Roman house with peristylum at two levels, as an element for distribution. Beside this patio there are remainings of corridors with mosaics and walls with drawings. It had a big private termal area divided in two floors. Domus of the Theater. Built on a later age, this domus is just behind the Theater scene, at the western side of the big porticated garden behind it. Around a patio -peristylum- many rooms are disposed: two of them with an apse -stibadeion-. The most part of these rooms have wall paintings: that and the apse confused, at a first sight, many scholars who thought it was a basilica. This assert was then rejected. Domus of the Marbles. It is a great house of a Later-Roman age, directly built by the wall: one of its façades belong to it. Other side of the house is close to the Kardo maximus and to one of its doors. It was distributed through a great patio -peristylum-, pavimented with slate and white marble. Rooms -some of them with an apse- were communicated with a long perimetral corridor. There are also remainings of termae. Dam of Cornalvo and Aqueduct of Aqua Augusta. Dam was built at Augustus age with a concrete central structure invested with stepped granite little ashlars. The whole construction was reinforced at the exterior wall by an earth slope as a buttress -counterfort-. Dyke was ca. 220 m. long, 18 m. high and 3,50 m. upper wide. 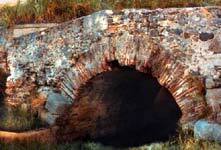 The aqueduct that takes water to the city -16 Km.- was a masonry tunnel with a barrel vault. It became a canal on archs in order to save earth depressions. Bridge over Albarregas river. 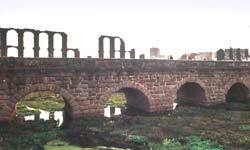 Built at the same time as Guadiana one, this small bridge is 145 ms. long and 7,00 m. wide. Placed at the Silver Way, it prolongs Kardo Maximus on the city close to Aqueduct of Miracles. It has four semicircular archs -5,30 m. long radius- and two lintel gates for drainage at one side. Solid appearance of the whole building must be outstanding, specially at the piles made without cutwaters. Its oblique position over the riverbed reinforce its pillars inproving its structure. This can be done because of the river scarce flow or because of natural variations of it. Bridge Alcantarilla. A small with just one gate. It is only 7 m. long and 4,30 m. wide. Made with opus caementicium -concrete- and covered by opus mixtum: brick and stone. Gutter. A Roman city should be endowed with a guttering net able to drain dirty waters as well as rainy one. That was usually designed under the street net. At Merida consisted of 13 gutters that end at Guadiana river and one at Albarregas river. Dyke for containing at Guadiana river: series of defences of containing to avoid floodings of some areas because of the river increasings. It is built with concrete, reinforced with pad ashlars close to those at the bridge. A part of the Arab alcazaba was built over these defences: therefore this is the best preserved section.